Its been pouring like crazy these last few days and I spent an evening quickly cleaning out my gutters in the rain. It was not fun or pretty but it got me thinking, is your home ready for the winter weather? 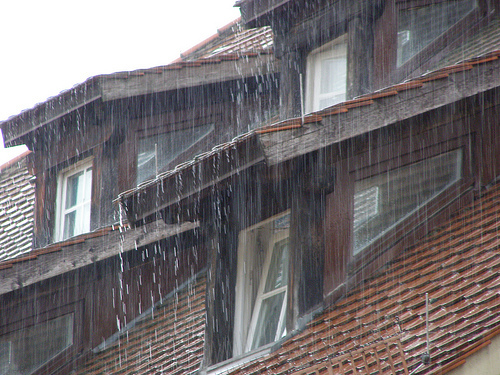 1)Prep your gutters and downspouts- clean them of debris and make necessary repairs. Its smart to clean before the rain, and then once again after the first big rain to remove any leaves and debris that wash down from the roof. 2)Check your roof, skylights, and flashing- if checking your roof is more than you can handle, think about having a professional inspect the roof for about $85-$100. 3) Inspect the house siding- check for damage, cracks and holes. Seal up the leaks with clear or paintable caulk. 4)Weatherstrip windows and doors- you wouldn't believe the draft and heat loss that can come from not applying or replacing old weatherstrips. 5) Sump pump and generators- have a basement or crawl space that may potentially flood? Now is the time to think about buying a sump pump. Generators can provide enough power to keep some appliances running during a power outage. 6)Have trees trimmed- rainwater and wind can make heavy branches fall and cause major damage to your property. Weak trees can snap or become easily uprooted. When there is a break in the rain, take the weekend to get you house ready so you won't be doing things in the dangerous and wet weather! Call me if you need recommendations for roof repairs and gutter cleaners!